Piso Ballard. Lovely decorated apartment with room for 6+2 guests. By the driveway winding between the fields you arrive to Massia Ferreras, which is a lovely country house where the owner has constructed two apartments in one of the buildings. The house is situated on a small hill, providing a fine view over the landscape with green fields with the owners' more than 500 grazing sheep. Piso Ballard is situated on the first floor in an independent building. The entrance is in level with the swimming pool, as the building is built on a slope. From the entrance, to the right you enter the 45m2 common room with kitchen corner, sofa corner, dining corner and not least panorama windows in the full length of the room. The kitchen is well-equipped with washing machine, dishwasher, ceramic hotplates, oven, microwave and toaster. To the left from the entrance you find the three large and beautifully decorated rooms, all with own bathrooms. All 3 rooms has double beds and private bath. Lay out of Piso Ballard: From the common room, you have access to the 100m2 covered terrace with an excellent view. There is a barbecue on the terrace, making it the perfect location for your meals as well as relaxation. On the other side of the main building, there is a very nice pool area with terrace and barbecue, swimming pool and mini golf with 8 holes. Additionally, there is a game room with table tennis and toys for small kids and two mountain bikes, which can be used free of charge during your stay. It is also possible to explore the surrounding by foot, following one of the indicated routes. For kids and those who like animals, is the evening where you can feed the hens, geese and give the newly born lambs milk from a bottle the highlight of the day. The house is situated on the owners' property surrounded by fields and forest. 2-3 km. away there is a village with grocery store, a restaurant and a bar. Catalonia: Discover the Catalan soul in a historical, carefully preserved but modernized country house. In comfortable distance from the crowded beach resorts, but still with the metropolis Barcelona, lively historical towns as Girona, Tarragona and Vic and the natural parks in The Pyrenees within short reach. We offer vacation in your particular pace, where you blend in with the open-minded and friendly Catalans. Enjoy the silence in the small hills in the pre-Pyrenees. Enjoy sports and outdoor activities as walking, canoeing or mountain biking. Or scamper about in the lively street- and café life in the Catalan towns. Here you will discover gastronomic, cultural and artistic impressions that stick. As something new we can also offer apartments i Barcelona and many more are coming. Or how about watching a football match along with 98.917 other spectators on FC Barcelona's legendary Camp Nou? The best advice is to come to Catalonia and see for yourself. Lisbeth and I (Bertel) are the owners of the company SYDENS FERIEHUSE. 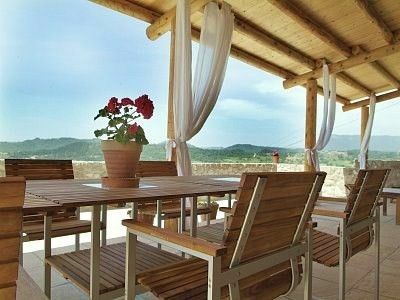 For the last 14 years we have engaged in letting out fantastic Catalan holiday homes, all of which live up to our criterias: they are authentic, charming homes and are all of a very high standard. We now let out more than 400 beautiful holiday homes, and some of them are advertised on HomeAway - We help Maria and her family let out Piso Ballard. Central Catalonia : Central Catalonia is situated where the Llobregat-river winds it is way from the Pyrenees down towards Barcelona. It is not heavily populated, and in the small town and villages you blend in with local life. The region is ideal for families or groups, who want a diversified vacation. Central Catalonia is situated in 400-800 metres altitude and has more than 300 sunny days on a year. If you visit the region in the spring or the autumn, most days will be pleasant, with temperatures from 18-25 degrees in the day time. In the summer it is warmer. The altitude makes the air dry, and the heath is very pleasant. It is good idea, however, to have the lunch-break in the shadow. The region's houses are constructed of limestone and with tiled floors to secure a pleasant indoor temperature. Central Catalonia is an inland area and has a rich cultural and natural heritage, including market-towns and cities with a great historical tradition. The house is situated on the owners property, where two fantstic holiday apartments has been build. The pool and the mingold area are shared, with the other apartment, which is for 4 guests. The terrace is private for this apartment. Everyday at 6 o´clock in the eveing the owner Ramona are mixing milk for the lambs and it is then possible for the guest to give them bottle if you like :-) There are also some hens and a few ducks to feet. It is possible to hire a private chef in the house for an evening or two. We also help arranging activities such as biking, hiking, canoeing, “behind the scene on a Michelin restaurant”, quads and are able to arrange other activities as well such as horseback riding, kanooing, hot balloon etc. ) Please do not hesitate to take contact and ask. 6 person holiday apartment with swimming pool in natural surroundings with easy access to Barcelona in one direction and the Pyrenees in the other. This part of Catalonia is highlæy recommendable. This is the perfect place, if you want to stay in natural surroundings and still with easy access to the many attractions of Catalonia. Request our activity document. The price includes: 7 guests, natioanl taxes, VAT, use of electricity, heating, water, bed-linen, towels (for each guest is one for the bath and one for the hands - (please bring towels for the pool and beach) and cleaning at departure. Not included: Catalan tourist tax: € 0,5/adult (+16) per night. PLEASE NOTE: At Catalan holidays in low- and medium season supplements may apply.